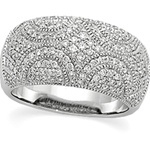 Pave wedding bands have become more and more popular because of the crazy amount of glitz and glamor they offer with an economical price tag. Some of our rings offer up to 150 unique diamonds in each wedding ring. 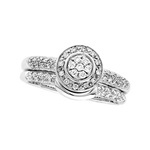 Set in white gold with 23 diamonds, this wedding ring can be worn alone or along with another for a unique wedding set. 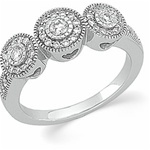 Pave rings are beautiful and fancy offering maximum bling for a minimum investment. A vintage and unique diamond wedding band featuring 67 genuine stones. 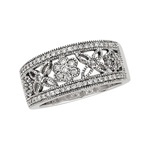 With 45 genuine diamonds, this ring is sure to impress. 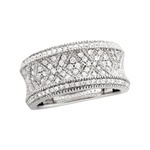 A gorgeous concave concept style pave wedding band with 118 genuine diamond stones. 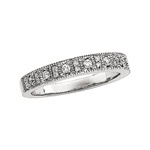 143 diamond pave wedding band offers maximum glitter and shine with minimum investment.